Hallmark's The Odyssey Movie is an interesting version of Homer's The Odyssey. Created as a mini-series for television, it does not feature the special effects you might find in a current day blockbuster movie but it is an entertaining movie and a relatively but not perfectly accurate reflection of the epic poem. My 16-year old son and I watched and enjoyed it. It is rated PG-13 and that seems reasonable, if a little young. I know I would have been uncomfortable watching the violence and sexual references with him when he was 13. Naturally, The Odyssey had plenty of action for him (although that is not a prerequisite for his movie choices.) It also had a good storyline which had both of us routing for King Odysseus in the end. 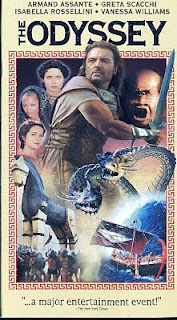 If you are familiar with the story, you will know that this movie focuses on Odysseus' ten-year attempt to return home after the end of the Trojan War. The DVD was discontinued but was reissued recently and is now available as a part of a DVD double feature bundled with Gulliver's Travels. You can check it out at Amazon by clicking right here. If you do check out The Odyssey or you have already seen it, be sure to let us know what YOU think. Buy Hallmark's The Odyssey Movie from Amazon. Read my complete review of The Odyssey. Learn how to properly store your VHS videotapes.